Yesterday, there was a part in a conversation that really ‘got’ me. Rainer was talking about the scientific fact that there are many, many more dimensions than the 3,5 we now see as reality. We said 3,5, because of the three dimensions of space, and the half one is time going in one direction – which is only half of the truth. Connecting this with Heisenberg’s uncertainty principle (as I understand it) – that on the level of particles there are no ‘things’ that exists, but what exists is a probability until it is observed in one way or another – it brought me to the power of thought and conversations. If the world that we want exists as probability, then the mere act of thinking about it – and even better: having conversations about it – brings this probability closer to manifestation, because it is observed in this way! In my understanding there are many levels (dimensions scientist would say) between our manifest world of space and time and the world of spirit. The simple act of thinking about ‘the world we want’ guides its probability into existence. The act of talking about it, which in my understanding is denser or closer to the manifest world, is an even stronger pull of this probability into the more manifest layers. And if more people talk about it, that’s even better! This links with a new blog that has this topic as focus: Conversations as co-evolutionary force. It is set up by friends of me and it will become important reading, I guess. “Everything exists only in conversation.” This is the quote one of the facilitators of Youth at Risk, started his pre-course day with. Sitting in front of him were 21 young boys and girls, on average 17 years old. Not easy stuff! I was sitting in the back of the big room, with a lot of other volunteers who make this program possible. Not every ‘thing’ exists in conversation, but ‘I’ exist also only in conversation! For most of the people this is a totally inner conversation – between me and myself – but what if I can embrace this quote as: I exists only in the conversations I have with other people? Then who was I yesterday when I listened to this facilitator, and who was I a few hours ago in conversation with Pierre, his wife and two of his friends? Then where does I exist? Where is the conversation happening? In myself? In the others (too)? Or is the conversation happening in the ‘in-between-ness’; in this empty void? Which is according to Ervin Lazlo, not empty at all, but full of energy. Are we shaping this energy between us through our conversations? It is so fascinating when you see patterns, same themes arrising in different places at – almost – the same time! 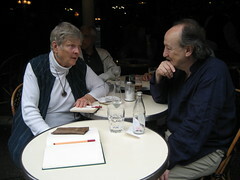 One of these days I found myself sitting on a terrace in Paris, with Anne Stadler and George Por. Anne started talking about being called to some places to heal old wounds. The conversation went on with how we can see the whole web of relations. Is Europe able to see it’s whole history of what it has done in the colonies? Who knows that the North-West of the US was connected with the rest of the world through trade in the pré-history? “Most exciting was the simultaneous hosting of eight local World Cafés throughout the greater Dresden area (on sustainable business, the arts, media, youth and education, etc. 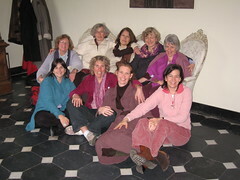 ), which led key leaders in Dresden to begin envisioning Dresden as a “learning city” using conversational modalities like the World Café and others to engage citizens at all levels in conversations about the questions that matter most to them— the “world as café” came alive in Germany! This is so consistent with one of the last things that happened in this Dresden gathering itself. One of the last blog post I made while being there was about a Chinese man (sorry I forgot his name) who brought a gift from his country: a cloth with a view on his city: Hangzhou. And he told about his dream to connect cities, and inviting each other. He talked about appreciating the history of the people you will get to know and much more that could lead to a ‘wisdom civilisation’. He got a big applause! And on the last afternoon in Dresden I participated in a conversation around the question: What is the highest potential of The World Café as a contributor to the development of large-group dialogue and collective leadership in Europe? One of us said that what is missing in Europe is a vision for Europe that is coming from the people, from ‘the inside’; instead of the politicians and other leaders. I noted down one practical idea raised by somebody else: setting up conversations between twin-towns! Being part of the World Café community and the Art of Hosting community I see three movements happening, which can all be seen as a translation of a re-connecting with wholeness. First of all we see how meaningful conversations become part of bigger processes, which lead to or are intended to foster community building. 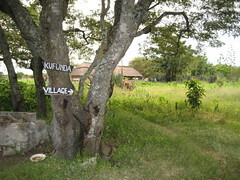 It goes beyond having now and then a meaningful conversation, but we see these meaningful conversations arise as an operating system in a community (like Kufunda and the Shire), a region (like in Ohio), a city. It is an expression of what Phil Cass came to see as the difference between ‘the individual voice’ and ‘the official voice’. People in their position tend to feel victimized by the big system they are working in, but when asked to act as an individual they are willing to engage in conversations, even when the outcomes are not sure. People tend to be resilient, positions are not! A next development tha I see is that body, movement, stillness, meditation, martial arts gets bit-by-bit integrated in these ‘talking’ communities. It is another integration or re-connection that happens. It will lead us in the end to – what I call – a wholeness of knowing. An integrated knowing of mental, physical, emotional intelligence; together with what we learn from nature’s intelligence, systemic intelligence and so much more! The last topic is about how to steward his kind of global movement, global communities. There is not one leader, and we see people all throughout the global netwerk taking up responsibilities. How to host this kind of living being? How to keep is somehow ‘on track’; meaning: congruent with it’s initial pupose, but flexible enough to include diversity and evolve over the years? We see both networks flourish on the friendships that are build over time. Isn’t this also a sign of reconnecting with wholeness, when work, life and voluntary engagementt is all one, and shared with each other? The complementary part of reconnecting with wholeness is that each uniqueness can become visible and manifest. Then what is the difference between these two networks? The Art of Hosting is more focused on the inner art of hosting, and trains people in and outside communities to become better hosts, which can then train other people. Something like martial arts in the field of hosting. World Café has its own book and gets translated in more and more languages. it has a new website and is building up it’s online community through blogs and forums. It seems more outside oriented. Please add your thoughts on this! MindMeister brings the concept of mind mapping to the web, using its facilities for real-time collaboration to allow truly global brainstorming sessions. Thanks to Gabor Por for the link! As I announced in my previous blog post I will travel tomorrow night, by night train, to Dresden to join the first ever held World Café Europe gathering. I am asked to blog about it, which I would do anyway. I’m not sure yet if there will be time enough to post the blog entries also here, so here is the link to the blog that is set up especially for this event. Probably it will grow into an online space for all World Café practitioners in Europe. At the moment there is nothing to read yet, but this will change soon! You are currently browsing the Seeds for a happy planet blog archives for May, 2007.